Tom Beaudoin is associate professor of theology at Fordham University in the Graduate School of Religion, and the author of three books, including Witness to Dispossession: The Vocation of a Postmodern Theologian (Orbis Books, 2008). 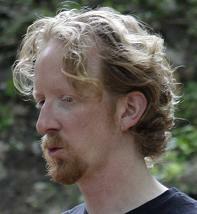 His research focuses on the relationship between “secular” and “spiritual” practices, and he currently directs the Rock and Theology Project (www.rockandtheology.net). Beaudoin chaired the Foucault Consultation at AAR and is presently co-Chair of the Practical Theology Group. Responses to three questions — however implicit — shape how theological education takes place: What practices do I have to offer as a theological educator, and how is it that those practices come to constitute the potential action domain for me? What are the practices that help hold life together for my students? How might professorial practice and student practice meet each other for the sake of a freeing study of theology? Spiritually or theologically significant practices are those orchestrations of identity with respect to a claiming power, and they are the basic material of theological cultures. With the discourses of practical theology, I have come to see theology as generated by, trafficking in, and oriented to, practices, including but not limited to such spiritual or theological practices. With Ilsetraut Hadot and Pierre Hadot, I look for the ways in which Christian theology works as a philosophy, a way of thinking allied to a way of life, an intellectual orientation grounded in and leading into formations of self and community. With Foucault, I cultivate a critical curiosity about how practices gain a spiritual registration and how those practices are dynamic forces stitching knowledge and subjectivity in particular situations. Practice-awareness, then, is a key part of what I do. I have taught undergraduates and graduate students in three Jesuit colleges and universities over the last nine years. I see no greater service that I can provide as a theological educator than having theological materials work with, through, and on my students and myself in the theaters of higher education. For a class to make a substantial difference in how one relates to oneself and others, in more searching and curious decision-making, in a deeper apprehension of what is at stake in their day to day lives, in their respect for the gorgeous mystery that they are, and bear, and encounter — all these are my goals as a theological educator. Helping a graduate student in ministry in framing a pastoral research project, talking with an undergraduate about theologies of tradition, or trying to calibrate the state of an academic theological question with a doctoral student in theology — for me these ought to be stations on the student’s way to more life, and richer desire, because they are also relational doors to the minister’s fuller grasp of the contours of a complex pastoral situation, of the undergraduate’s ability to talk to their parents or peers about their religious decisions, and of the doctoral student’s ability to make their way into a conversation, a community, a conference, and a career. But if I am led forward by a sense of trying to work with theology for my students’ freedom to make of their desires a free enough life with and for others, to have the experience of theological education make of their passions a spiritual exercise, I am also shadowed by my sense for the ambiguities, dangers, and destructiveness of Christianity and Christian theology, and in particular Catholicism, Catholic theology, and Catholic education. This is a theological tradition and way of life that is also suffused with a kind of power liturgically, socially, and intellectually both beautiful and corrosive. Figuring that out and how this is the case, and allowing this to condition my teaching, have become important tasks for me as a theological educator. So I feel both led and shadowed by what can happen to the life of the spirit in the ecclesial, social, and academic cultures of which theology is a part. As a result, I see the question of spirituality as an ethical question for the theological educator, a matter of asking what hand we have in shaping and forming, and toward what, and in whose interest. Theological education has a role to play, however modest, in the sometimes irreversible good or damage we have the power to do to each other, individually and communally. As a result of these orientations, I think that being conducted into a particular mode of theological experience is as important for my teaching, even more so, than the clinching of an argument. I take it that formation by the theological cultures represented in education is what makes clinching arguments significant for people. With many interpreters of our current cultural situation, I see an appreciation for spirituality as a strikingly widespread interest, including and especially among my students and those with and to whom they theologize and minister. One need not reduce the many faces of spiritual self-identification to one definition to appreciate that for many reasons, many of our students want to taste the meaning of their relationship to what might claim them, a wanting that tends to have students looking for ways of overcoming religious divisions, of articulating shared ethical commitments, and of putting things together in a practical way that makes sense for their immediate felt relationships. There are critics and endorsers of this turn to spirituality, but I think that an attention to practices helps us hold this research, and to relate in theological education to our students in a promising way. Unfortunately, some of the literature on the popular practice of spirituality lacks interest in practice models in theology, focusing much more on what young adults do and do not “know about their faith” or “their religion,” the supposed scourge of religious illiteracy. That spirituality is now typically formed and informed, even transformed, outside religious institutions. As Robert Wuthnow and many others have argued, secular music happens to play a substantial role in the formation of identity and spiritual navigation for many if not most young adults in the West and in the Western-influenced globe. Many scholars in the American Academy of Religion have shown how today’s students of theology bring with them influential elements of grammar, symbol, emotion, logic, and intuition formed in their engagement with popular media culture. One form of popular culture that seems to be particularly widespread and influential in everyday Western life is secular music. It is thus important for theological education to search out a way of appreciating the “extra-ecclesial” formation going on today, in secular music and beyond, especially as regards the shaping of sense and desire. Given these vantages on theology, I often try indirect approaches to spirituality and practice with students, asking them with various degrees of specificity how various practices in the culture of theological education (reading, discussing, reflecting, writing, ruminating) clarify or complicate their significant life practices, “spiritual” or “secular.” I also want to be cautious in traducing dangerous territories of confession, which are all too easy to provoke and exploit in theological teaching. So I try to remain nondominative in how I work with students, keeping a broad lens, keeping my own integrity, trying to show that I respect theirs as well. This is also because I think that in how we work this out, the interaction itself is theological material — it is a kind of theological experience for “us” and for “them” that will condition how and what we theologize afterward. I also often focus not only on how the spirituality of students relates to the class, but on the proposed nexus of enticements to spiritual identification in the texts we are reading, as a way of noticing how texts assist in working up a religious identity and practice. I also sometimes teach a “spiritual review” as part of learning to theologize skillfully, asking how one’s theological research sits in one’s spiritual life. If we take spiritual practices to be those through which what is most important in our lives passes, we cannot fail to ask how it is that our teaching plays out these practices, what disciplines we are recommending or concealing. First, see desires as the most significant curriculum in theological education. My primary task is to teach for a depth of existential engagement in my students that will be both freeing for them in some small way now, and useful for later appropriation of our studies in their lives. This means that I see the curriculum, essentially, as consisting in their desires as worked through in their/our (culturally-situated) practices. From this pedagogical perspective, I must join the theological content of my courses to that curriculum in such a way that theology becomes employable as a metal detector of sorts, that students can “sweep” across their lives, questions, and cultural engagements so as to help unriddle their placement in the world with the assistance of a theological sounding. Of course, I must also teach them how to take apart and repair the equipment, not to mention showing how different equipment will work up or register different treasures, dangers, and underground phenomena. Desires are not the same as literacy. Theological literacy is often about how the other of the scholar does not know what the scholar does. Many years from now, scholars will taxonomize the ways our academic culture invented expressing our dismay at how little students know about religion, how remarkable their failures of critical thinking, how trite their knowledge of other traditions, how uninterested they are in true argument. It is a governing assumption. Yet I have yet to read a discussion of the topic that argues that the professor also has a certain theological illiteracy: of their students’ theologies and the methods that would allow a comprehension of them. Are we positioned to experience students richly enough as engaging in theological acts or practices? But how can there be an appreciation of the force of student desires in theological education without a concomitant question about faculty desires, and the spiritual atmospheres of the institutions in which we work, especially as impacted by the practices that express the aspirant social class proffered by the institution? It does not seem to me we have ways of registering the incitement to aspirant social class in the ways we define and reward success in academic life. The employment process, reappointment, tenure, promotion — they typically have built in naturalizations, rarely problematizations, of academic practice. Second, try to notice the operative sources of theology. The question introduced by spirituality in the teaching of theology foregrounds the question of where theology or theological experience comes from. If one wants to account for theological difference and production, especially to understand better why we are susceptible to some theological schools and arguments more than others, and how that susceptibility can be more fully appreciated in theological education, we ought to consider “extrarational,” “nonrational,” and “nonconceptual” influences. This is why it is helpful to read accounts of how theologians actually come to their beliefs and practices, instead of seeing the operations of theology as only, say, debates about concepts between schools. Third, find allies in theological comprehension of practice. This turn to practice opens systematic, moral, philosophical, and practical theologians to a potential new era of work together which is quite promising. And it provides an opportune time for theological educators to get in touch with specialists in practice, from all religiously-related disciplines, including not only the domains mentioned above, but also pastoral care and counseling, pastoral and practical theologies, religious or Christian education, and spiritual direction. These are among the scholarly communities that have never forgotten that the question of formation belongs in theological education, and for whom an “enlightenment after the enlightenment” is not a new question. Carrette, Jeremy, and James Bernauer, eds. Michel Foucault and Theology: The Politics of Religious Experience. Burlington, VT: Ashgate Publishing, Limited, 2003. Hadot, Ilsetraut. “The Spiritual Guide.” In Classic Mediterranean Spirituality: Egyptian, Greek, Roman, edited by A. H. Armstrong, translated by Margaret Kirby, 436-459. London: Routledge, 1986. Hadot, Pierre. Philosophy as a Way of Life: Spiritual Exercises from Socrates to Foucault. Translated by Michael Chase. Malden, MA: Wiley, John, and Sons, 1995. Marks, Darren C., ed. Shaping a Global Theological Mind. Burlington, VT: Ashgate Publishing, Limited, 2008. Wuthnow, Robert. After the Baby Boomers: How Twenty- and Thirty-Somethings are Shaping the Future of American Religion. Princeton University Press, 2007.